My Gawd’s stories are imaginative, rambunctious, and sometimes sordid. Fairbanks’s idiosyncratic and rollicking My Gawd! 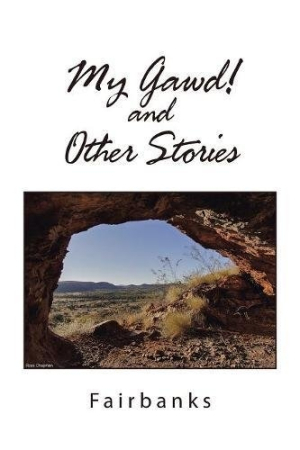 and Other Stories contains thirteen creative, startling, and surprising tales. The book includes a long narrative poem, a fairy tale, and a play. It operates by a logic all its own, encouraging its audience to start with the last piece. Its work is clever, edgy, twisty, and fun, though it also goes to dark places and may at times be too lewd for some sensibilities. “Twisted” explores whether a troubled marriage with dark secrets can survive at a seaside resort. “A Globule of Glory” focuses on immigrants working in opal mines, optimistically hoping that all of their digging turns up something—and the unexpected repercussions of a big find. “Among the Gum Trees” follows a teen who’s camping in the wilderness, while “Two-Faced” concentrates on an amnesiac soldier who wakes up in an unfamiliar cave where temptation abounds. In “Go-Go Berries,” hikers come across berries in midwinter that are more than what they seem. Often ribald and filled with black humor, these works playfully relish subverting expectations. Widely varied, they include memorable backdrops like a nursing home and the Australian outback. Settings are rendered so well as to be characters of their own. From the claustrophobia of a woman stranded in a dark mine to the heady thrill of cycling up the mountains, feelings are palpable. Characters like a pregnant wife, Genevieve, who feels increasingly skeptical about her husband, are vivid. Her story is fraught with tension that builds to a cathartic release. Lewis, a student-athlete surrounded by sisters, has authentic interactions with his family members; his emotional state is well rendered. The monks of the Brotherhood School are drawn with distinct personalities even as they act as part of a greater whole; their story is undermined primarily by its reliance on exposition. Stories are told with flair, including “The Bouncer,” which has a campfire feel as an abduction gets really weird really quickly. Stories build suspense and set moods well, building up to big surprises that maximize shock value. Prose is polished and poetic. Opening lines grab attention: “Genevieve hated Christmas, honey and peppermint schnapps.” Some lines, though, lack subtlety; italicized ends of stories are hit or miss as punch lines and postscripts. My Gawd’s stories are imaginative, rambunctious, and sometimes sordid, with big themes including nature, science, and yearning.